Here’s the quilt. I have each embroidery framed out with fabric from my stash. Next I’ll adding muslin to make them into 12-inch blocks. After that, I’ll have the wind at my back. Well, at least until I get to the machine quilting part. I bought a new foot for my machine and will be giving free motion a whirl on this project. I could have it done by a professional quilter, but I want to do this one by myself given the cool collaboration Abby and I have. I want the finished project to be ours alone. 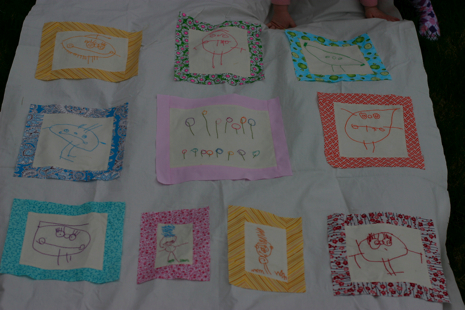 (Yes, I realize this desire may come back to haunt me should the quilt end up a wadded mess in a few days.) Don’t worry, I’ll practice on some scrap fabric before I fire up the Janome and start stitching with wild abandon. So have you made a Meathead Hat yet? The pattern is from “Knitalong,” a great book by Larissa and Martin John Brown, a couple I just interviewed for CraftSanity episode 76. The pattern is free right now, so hurry up and download it. It’s fast and fun and very cute. I made the hat in the photo today. I just have to stitch up the seam and add the crayon pocket and I’ll be done. The plan is to give Abby one for her birthday on Wednesday. I know, it’s April and not really hat weather, but this hat is super cute and totally appropriate to wear while sketching in air conditioning. I’m making a blue one for Ameila next and probably a blue one for me, too. Oh, and here’s a friendly reminder to enter the random drawing to win a copy of “Knitalong.” To enter, leave a comment below the episode 76 post. 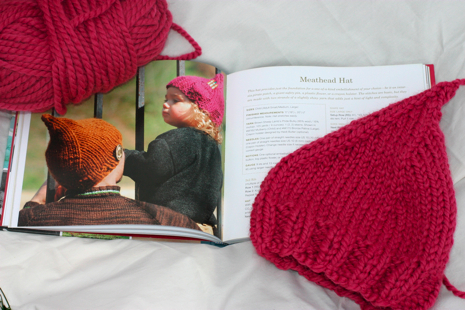 What is your favorite knitalong memory? What have you made? What do you want to make? 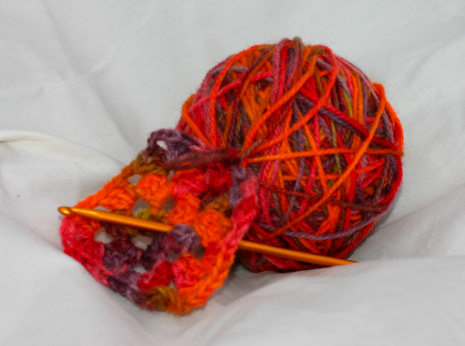 Why do you love knitalongs? The deadline to enter is Saturday, April 26. Because I finished the hat and the quilt project was too big to bring in the car, I started crocheting a granny square blanket on the way to the ice cream shop. I’m using the wool I dyed with Kool-Aid a few weeks ago. It’s definitely Sunday. I always feel like I have to craft enough for a lifetime the night before I head back to the office. Have a great week everybody. I’ll be posting my chat with Jenny Hart soon, so stay tuned!